Ronel Pierre is an accomplished artist from Haiti. Pierre's first exhibition was in Berlin, Germany, he was only 12 at the time. After experiencing severe torment by his peers, Pierre spent much of his time alone, learning and creating art. He has made his ultimate goal in life to help educate through motivational speaking on the mistreatment of others, how to serve, and community service and volunteerism, as he continues giving back to his Haitian brothers and sisters and those in need. He plans to use his love of creating art, public speaking, and his newfound love of writing and illustration to accomplish this. Pierre is a professional interpreter and translator fluently speaking four languages (Kreyol, English, French, and Spanish). Currently, he is working on an organization called the Ronel Pierre Creation Foundation. 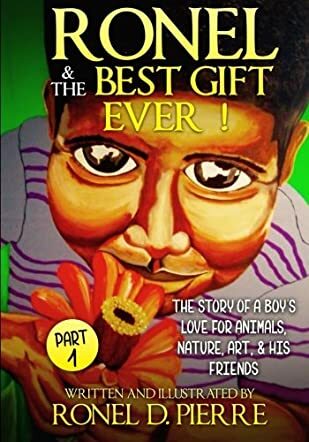 Ronel and the Best Gift Ever by Ronel D. Pierre is based on the true story of young Ronel who lives in the orphanage and longs to find his real parents. Through his imagination, he befriends Tootie the parrot and Sofy the spotted dog, who both agree to help him in his search. He puts posters of his lost family up in the forest. The other children at the orphanage laugh at his ideas, and when Kat, a kind woman, visits the home with gifts for all, Ronel misses out on a present and sits alone and lonely. But then Kat has a wonderful surprise for the little boy and Ronel finds happiness and a home of his own after all. Ronel and the Best Gift Ever is one of those special stories that are part story and part concept book. Pierre’s account of the sadness and loneliness of an orphaned child is touching and heart-breaking. Ronel experiences what many children in such a situation experience: a longing and hopefulness that their parents are somewhere and that things will change for them. I love the way his imagination provides him with motivation and further hope, and his boldness in asking for what he wants. What a perceptive child too, to see that the unkind words and laughter of the other children at the orphanage are just projections of their own feelings of rejection and longing. This book has a few special messages for young readers: about appreciating our homes and loved ones, understanding others, and doing what we can where we can to make a difference. We can’t have everything we long for in life, but it is good to believe situations can and do change in time. And it is always better to allow what happens to us in life to help us develop compassion and appreciation, and to use that to understand others. A gentle, poignant and well-written story that is accompanied by colorful and detailed illustrations on every page. A special book to share with a child or group of children which can prompt discussions about the issues raised by the story. So, a very worthy addition to any child’s home or class library. This is by far my favorite children's book for three main reasons 1. It's a true humbling story, 2. The art arebbrilliant and 3. The amazing philanthropic work of the author. I enjoyed reading this ebook and can't wait to get my paper back in the mail. Ronel & The Best Gift Ever is such a charming little book that pulls on the heart strings. It's a relatable story about a young orphan boy who longs to find his family and finally finds a loving home. The illustrations are beautiful, and the story teaches the reader to never give up on their dreams. It's a great story to share with your children as well. It was truly inspirational! I can't wait to read the next one! Ronel and the Best Gift Ever is a touching and beautiful book. I love the unique style of the colourful illustrations. I found that the illustrations managed to convey so much emotion. I also loved the animal characters in the book and how they try to help Ronel. This is a story that children will enjoy and it will also help them to understand the value of family and being kind to others. How could you not like this book? I think everyone does. It is a very touching story of a child in an orphanage who really does get the best gift ever! However, I believe that the reader can see that that gift is returned to the giver ten-fold. The illustrations really affect the reader in a primal way, conveying great emotion. The book brings to light the plight of orphans (which always makes me wonder why they make it so gosh darn difficult to adopt a child), but also brings hope to those who may be in the same difficult situation that Ronel was in. A wonderful and easy read, great for children. Recommended! a family we love and who love us. The illustrations were also wonderful. I highly recommend this book. It is simply inspirational! I look forward to Ronel Pierre's next book with great anticipation! Beautifully written and inspirational. I couldn't put it down. The book is entertaining, uplifting and educational. The greatest gift ever for a child is loving parents, the topic of this book. According to UNICEF, there are more than 132 million orphans worldwide - a shocking and disturbing number! The crisis in the Middle East has aggravated this further by creating refugee orphans, kids without their parents fleeing into the unknown. This book can bring hope and encouragement to those desperately searching for loving parents and urgent answers to those who need to understand how it feels to be an orphan and to one day get the greatest gift ever. Because this book is autobiographical, and beautifully illustrated by the author, it has both authenticity and legitimacy. Read it and share Ronel's experience. I love when people read a story and feel a genuine connection. This book is poignant and heartwarming. We love Romeo and pray for His continues success.